I know you have probably gathered by now that I *love* breakfast. We have a hot breakfast most days of the week including school mornings. When you make large batches of oatmeal or freezer pancakes and breakfast cookies, it is pretty easy to have a hot breakfast on the table in a matter of minutes even on the busiest of mornings. But about once a week I crave cereal. I don’t think a day went by in my childhood that a box of cereal wasn’t breakfast, so for me it is just comforting, and familiar. I gave up boxed cereals years ago when I learned that the extrusion process that the grains go through literally make the grains toxic and void of any nutrient value (yes even organic boxed cereals). I went years without cereal until I tried making granola. I wasn’t sure I was going to like it, but as it turns out not only was it really easy to make, but it was so delicious! As children have multiplied in the house, I have had to modify how I approach granola making. What used to feed my husband and I for a few weeks, only lasts a week or two now, and I don’t care to make granola every month. I get my big stock pot out and to have enough room to mix this large batch now! We have granola about once a week and this lasts us a few months. If you have a dehydrator, great! If you don’t, no problem! I made granola in the oven for years! I have only had a dehydrator for a couple years now, and I really do love it. I have a “middle of the road” dehydrator and feel like it works fantastic – I use it all the time! And there is *nothing* quite like the “set it and forget it” of letting the dehydrator dry out your granola overnight and waking up the the warm smell of cinnamon in the morning! I store the granola in gallon freezer bags laying flat in the freezer. I keep one bag in the fridge for use to pull from for breakfast or just to grab a handful for a snack on the go. 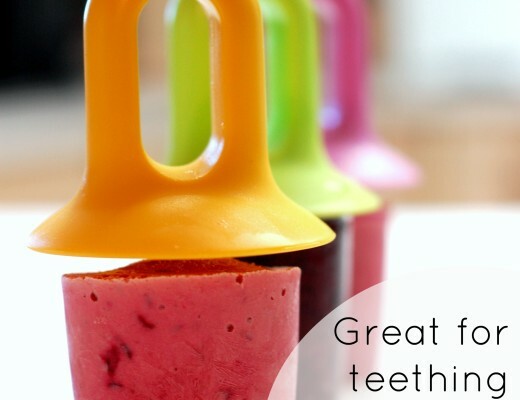 The simplest of ingredients and sweetened with a little fruit and raw honey. 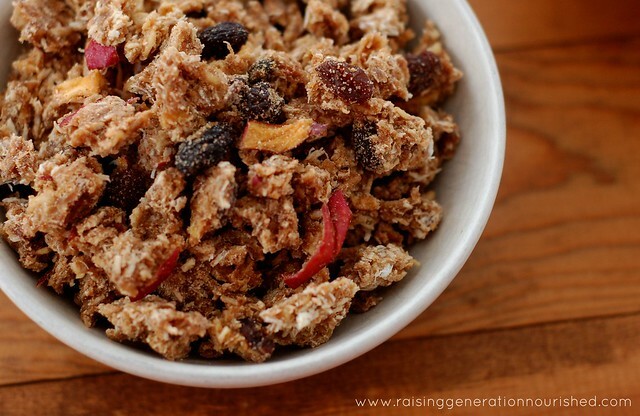 The kids will love the little bits of apple and raisin – it is perfect drenched in raw milk or coconut milk, or used as a topper or mix-in to whole yogurt. Every so often I crave cold cereal. This hits all the fun flavors I remember from my childhood, without the extra sugar. The day or night before you want to get the granola in the dehydrator, put the oats and lemon juice along with enough water to cover the oats by an inch in a large mixing bowl. Set the bowl under the light in your oven for 8-12 hours – this soaking process breaks down the phytic acid in the oats and makes them easier to digest. I like to soak them all day and that way I can dehydrate over night. 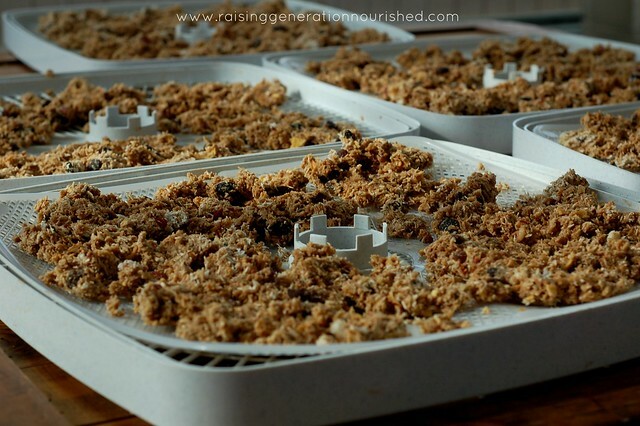 It also works to soak overnight and get the granola in the dehydrator the next day. After the soak, drain the oats in a strainer while you get the rest of the ingredients into a large mixing bowl – I use my stock pot because there is a lot! It makes the mixing easier! 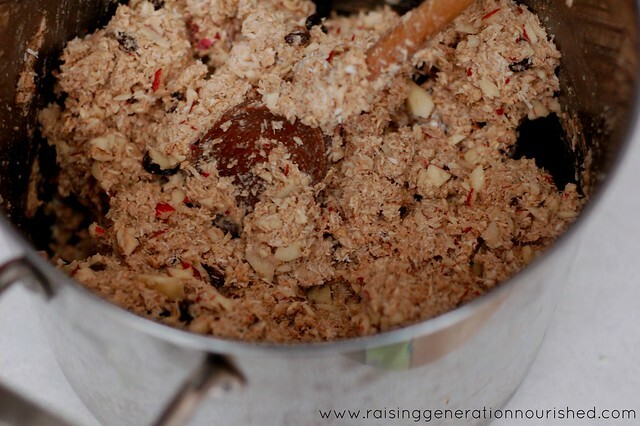 Add the strained oats to the mixture and combine well. Did you grow up on cereal? Do you miss it?! 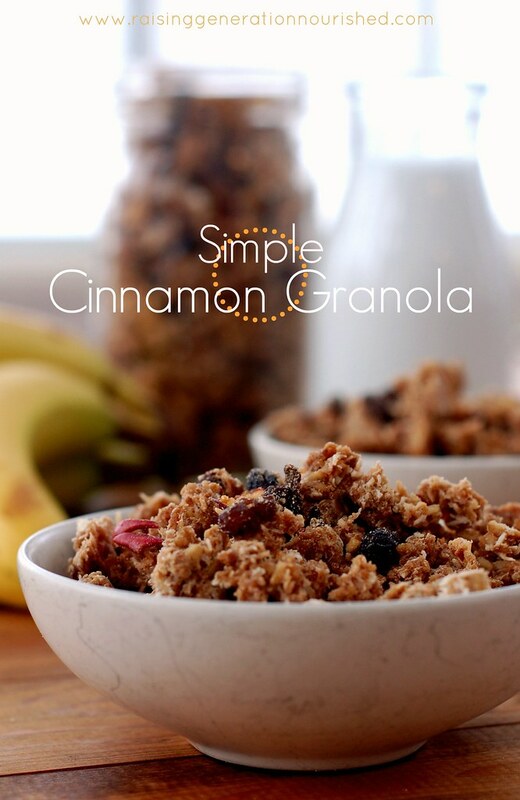 Let me know if you give the granola a try – keep me posted how the kids like it! This looks great Renee. I would love to find a granola that is nut free and no corn derivatives. How does your granola taste without the added nut butter (including the sun butter – we are not fans)? We are not a nut free family but I need to have nut free recipes for his school. Thanks! Hey Jessica! Yes definitely leave out the nuts/nut butter – I put them in there for the added protein but have made granola without the nuts for sure. Oh Renee I am with you, I think the only meal I love more than breakfast is brunch! lol This granola looks just perfect for either. Thanks for sharing! This is fabulous! We just got our dehydrator so I’m looking for more recipes to try. Yum! This sounds so good! I wish I had some to snack on right now. Do I have to soak the sorghum too? This looks so yummy. Hi Anna – from what I understand sorghum does not need to be soaked but you can if you want! 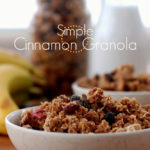 I make granola at home too but never soaked and dehydrated them! Makes sense though. Thx for the recipe! Love the texture of this. It looks wonderful!! Thanks for these ideas. Will get the ingredients together and try it out!! Could the coconut shreds and sorghum flour be substituted in this recipe? If so, do u know of good alternatives? Sounds tasty! Hi Caryn – yes they can be subbed. What sort of things did you have in mind – gluten or grain free options? You can just use whatever other gluten free flour you like to use for the sorghum flour. Taking out the coconut shreds will change the texture a bit but you could just use more of a different flour. Does that help some? Hi Renee! This looks great and I plan to try it! I just ordered sorghum grains from my co-op to try for the first time, I have a grain milk so will grind them into a flour. I noticed in an above comment that you think it’s not necessary to soak sorghum, can you tell me your thoughts/resources on this? I can’t find much online in relation to this specifically. It doesn’t bother me to soak the grain, dehydrate it, then grind it, because just like sprouting beans it’s mostly hands off work…but if it’s not nutritionally helpful I am happy not to do extra steps for sure! Thanks! The only flours I have on hand to sub in for sorghum are coconut flour and almond flour, but I don’t want to dry it out too much. Should I just add the almond flour and skip adding an additional flour? Thank you! I’m excited to try this out! Love your site. That helps, Renee. Thanks! I just don’t have sorghum on hand. I’ll take into account the difference in texture without the coconut shreds. Someone in our house is picky about texture and coconut shreds just don’t fly. What other flour can I use with this? I have gluten free, coconut, brown rice, and tapioca. I cant find the listed flour locally. Never mind, I just saw your respond to another persons comment. Thank you. Hi Jessica! Ok great! Let me know if I can do anything else to help! Would maple syrup work in place of the honey? 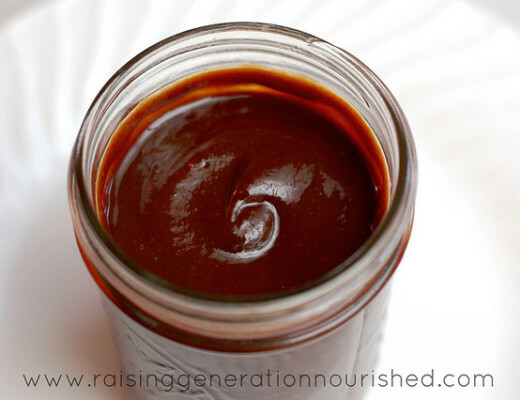 My 2 year old can’t have honey due to allergies and I’ve been wanting to make this! This cereal looks and sounds amazing! Only thing is, I don’t own a dehydrator. Can I use something else instead? Can I put it in the oven? What temperature? Hi Soni! 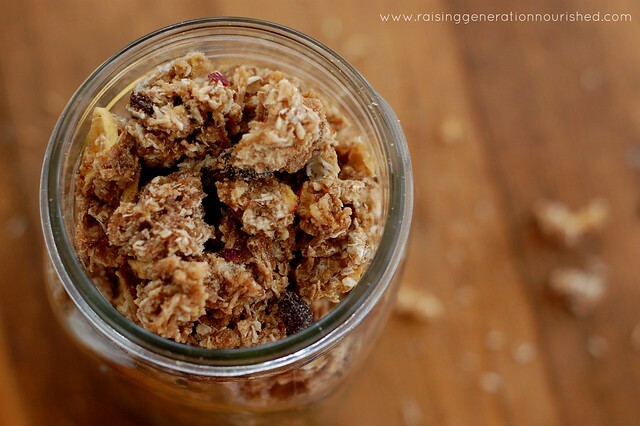 Yes you can do the granola in the oven – just set it at a lower temperature. If you go as low as the oven will go it will take all day, and you will want to stir it around every hour-ish so it doesn’t burn and so that it can dry out. You could go a bit higher temp such as 250 degrees and it should take a few hours, but again still stir it around every 30 minutes-ish. I have found the texture to be lighter and crispier with a dehydrator versus an oven, so if it ends up being something you love to make, it would be a good investment for you! My husband is deathly allergic to cinnamon (it’s been hard for me to give it up!!) and I don’t like shredded coconut. How do you think this would taste without these 2 ingredients? Anything to substitute instead? Hi Amy! Yes, don’t add the cinnamon! Yikes! You could do almond extract for a different flavor, or use other warm spices like cardamom or cloves if he tolerates those. 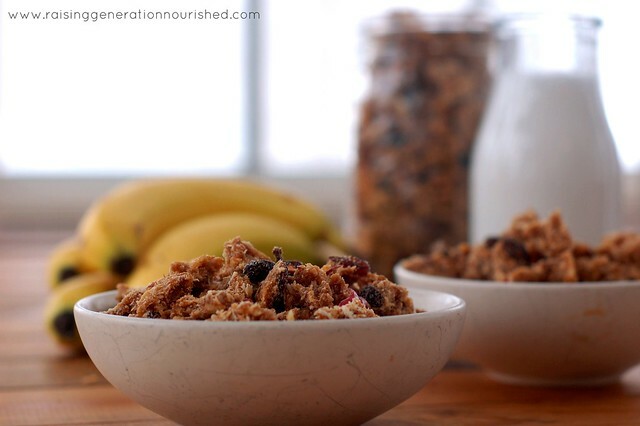 And instead of the coconut you could just add more oats or use some chopped nuts/seeds that you like.